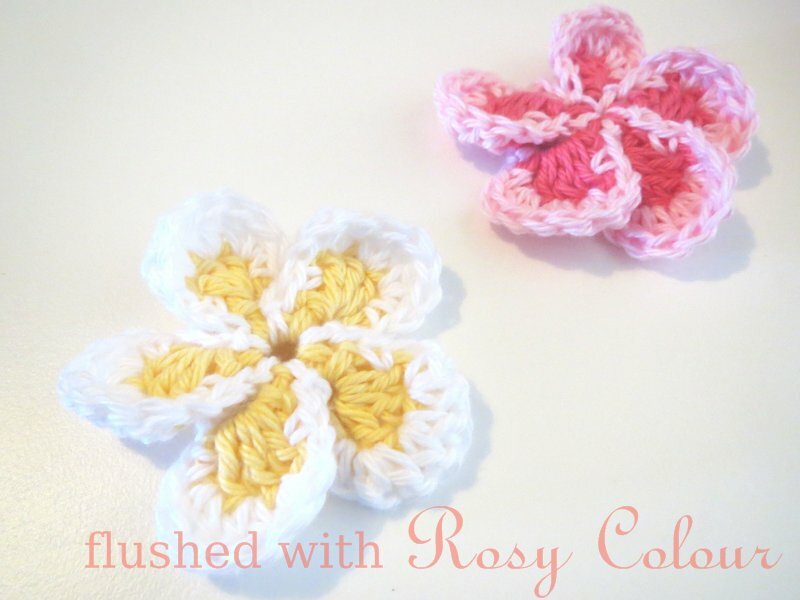 Flushed with Rosy Colour: What can I make with Plarn? Plarn is yarn made from plastic shopping bags. I first saw the pattern on how to make it at Crochetspot, but there are heaps of other sites on plarn on the internet. You can see some examples of the types of things people make with plarn to sell on Etsy, a UK site for handcrafters to sell their wares. The idea to try rag rug making came to me yesterday because some small rugs I have in the kitchen are getting pretty old. But when I inspected my megre collection of material scraps, I didn't feel inclined to rip it all up into 1 inch strips to make a rag rug, in case it didn't work out and I wasted it all. But one thing I do have a lot of is pastic bags, I even gave a bunch to my sister-in-law last month, as well as throwing away another bunch before Christmas, as I just had too much rubbish in my house. 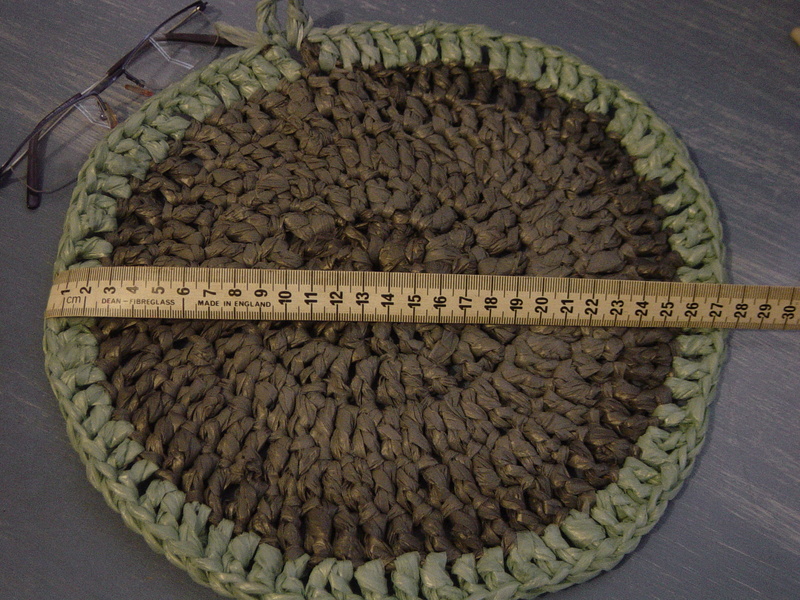 For some rag rugs, you simply crochet 1 inch strips of cloth into a flat round. So I gave making this plarn thing a go, planning to try a round. I figured the worst that could happen was it wouldn't work and I would just throw the plastic away. The first thing I tried was just making a simple round using my biggest crochet hook and the same coloured bags. The colour I have most of is this horrid army green colour, it makes me feel like I'm in the military! This first round I tried used the plastic from 10 shopping bags. I added one row of a paler green colour, just to try. I really do not know what will become of this object, as it was just a trial. As I was surfing the net last night for ideas on what to make with plarn, I saw a foto of what I think was a doily made from a freezer bag. I haven't got a lot of practice making doilies, I find them a bit impractical, although I do have a few special ones my great-grandmother made. I was about to throw away a freezer bag after dinner when I thought I might try making a small flower. 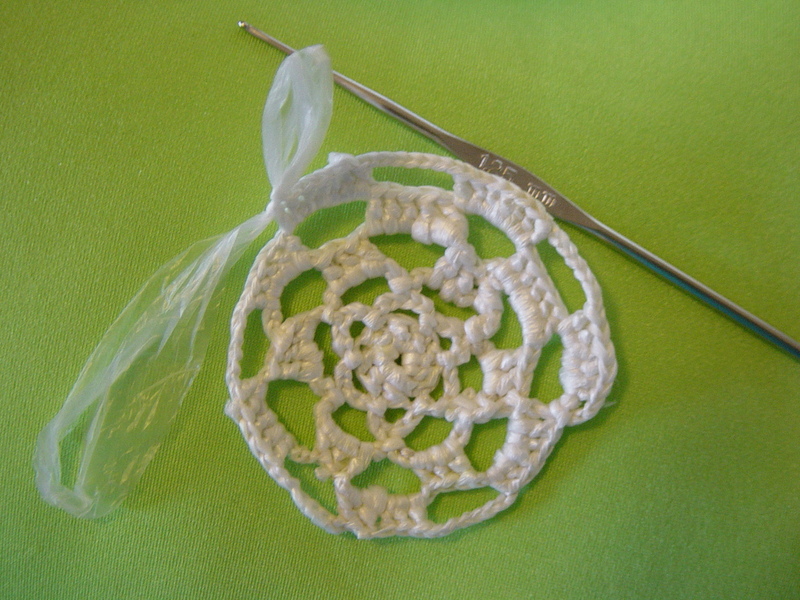 This is made with the very smallest of my crochet hooks, a 1.25mm, and using the pastic from just one freezer bag. The diametre is 5.5cm. Again, I have no idea what practical use this object could have, it was just a trial. From what I've been able to see from surfing the net, most objects made of plarn are shopping bags and handbags. These take 50 to 100 plastic shopping bags to make. As I only have about 50 here, if I'm going to use them, I need to think about what practical objects for my home I can make with that amount of plarn. I've already sorted it into colours, although I don't think I have enough of the nicer colours to make one thing. Maybe I can make something like drink coasters, flower hairpins or a shower puff. Hmmm, wonder if I'll ever need an Easter Egg Basket! 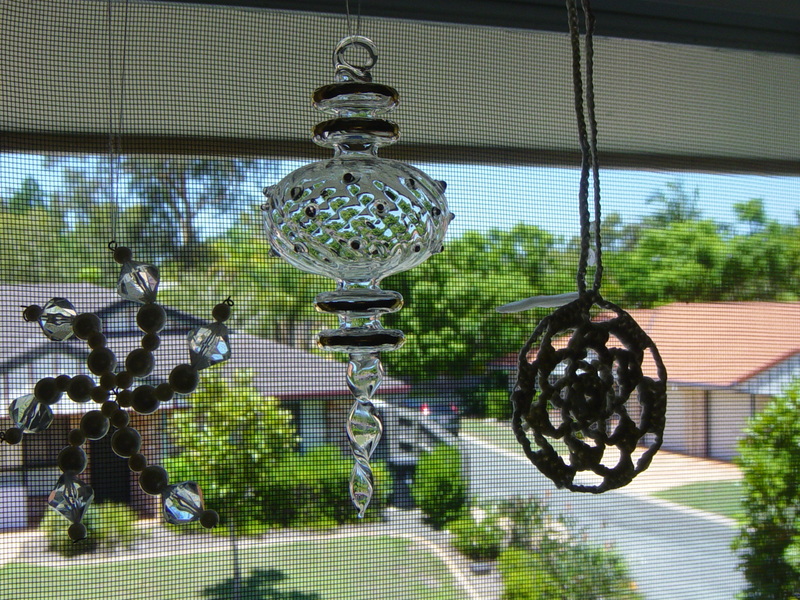 edit: What else to do with a plarn small flower doily but to hang it beside other useless danglies in the window?